Blogging is hard work—trust us, we know. Many a business has been enticed by the shiny newness and endless possibility offered by a fresh, blank blog property only to quietly abandon it several months later, discouraged or distracted by yet another shiny content channel. The rigors of keeping up with a consistent publishing schedule might be what’s led many renewable energy marketers to adopt a program of publishing the latest news about themselves and their industry on their company blogs. Industry news stories about tax incentives, regulatory changes and fluctuating energy prices make up the lion’s share of blog content for many renewable energy brands. But publishing industry news items directly to your business’s blog could be a huge missed opportunity in content marketing. By doing this, you’re serving readers content that they could easily get elsewhere on any number of news sites, and you’re squandering a chance to add valuable context and build authority in your industry. These news items should really be viewed as timely and relevant content ideas served up to renewable energy brands on a silver platter. Instead of simply re-posting the news on your company blog, try creating unique and useful blog posts about these trending topics—in a word, newsjacking. Newsjacking, a term made popular by marketing strategist David Meerman Scott, describes the practice of latching onto a breaking news story to gain more exposure for your business or product. It requires you to stay vigilant to learn about news stories when they’re trending and to be nimble enough to generate original content on a topic quickly and accurately. The good news is, if you’re already posting the latest industry news on your company blog, you’re halfway there. You probably already have news feeds or social media alerts set up to listen for news about your energy sector. You’re in a good position to take your blog posts a step further by adding your own spin or angle to the news content. This adds more value for your readers and brings traffic to your site from people who are searching for these trending topics. Technological developments, new regulations, shifts in legislative sentiment—these are all fertile ground for developing relevant and differentiated blog posts. You can inform people of the latest industry developments while adding helpful context and building your reputation as a thought leader. Newsjacking can be purely educational or it can be fun and entertaining. And it can go terribly wrong for brands that approach it haphazardly. So how can you set your business up for newsjacking success? Businesses can employ several different story tactics to capitalize on trending news. For example, you can try to be the first in your industry to report breaking news (as you can imagine, this is the most difficult approach to pull off consistently). Or while a topic is still trending, you can recap the news story for your audience in a personalized way that will resonate with them and answer their questions. My favorite approach for renewable energy companies is what Ginny Soskey calls the “Fashionably Late Deep Analysis.” Instead of being the first to report a story, this is where you take a bit of time to step back, then offer up a thoughtful perspective on the topic. Although your readers might have already heard the news elsewhere, you’ll be adding value through your expert analysis. 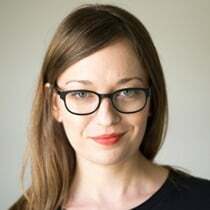 “This type of post works especially well for news stories that have long lifespans, which are usually ongoing changes or trends,” Soskey writes. Don’t sell: This isn’t the time to shill your product or service. Think of these newsy blog posts as top-of-funnel inbound marketing materials. Readers are most likely to find these posts through search results, inbound links and social shares. This means they’re probably interested in learning or being entertained—not buying. Be helpful: Think of relevant news items as teachable moments. Use them to help explain complex topics (processes, technologies, laws) to your readers. If you’re not adding value with your perspective, you’re just being opportunistic, which might get your brand the wrong kind of attention. Tread carefully: If a news story is controversial or there’s a chance your take on it could be offensive, think very carefully about whether sounding off on it is worth the risk. It’s ok to share a controversial perspective if that’s your business goal. But the last thing you want is to create a controversy unintentionally, through shoddy research or a lack of tact. Let’s look at how two different blogs approached the same news event. 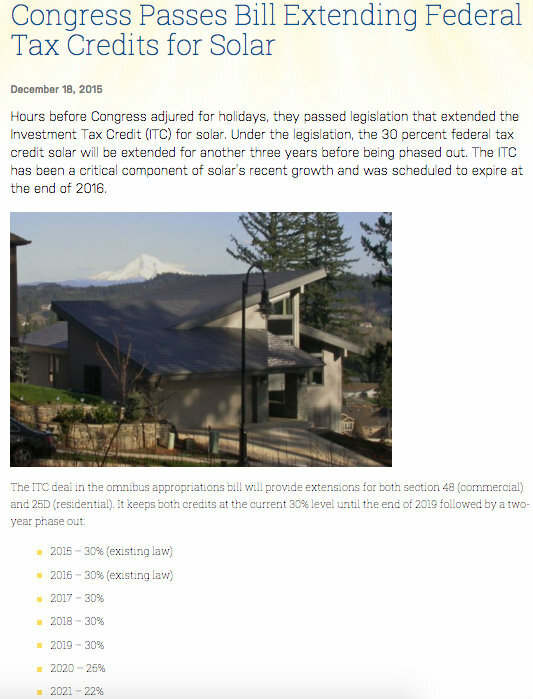 In December 2015, a solar organization recapped a news story on its blog about Congress’ extension of the Investment Tax Credit for solar projects. This post is relevant to the organization’s industry, and it’s helpful in that it explains some of the specifics of how the credits work. But there are still opportunities to optimize the post if we view it through a newsjacking lens and try to add value rather than merely rehash the news. How much will I save on a home solar array by using the solar tax credit? What exactly are the steps for taking advantage of the credit? How likely is it that the credits will be extended again in 2021? 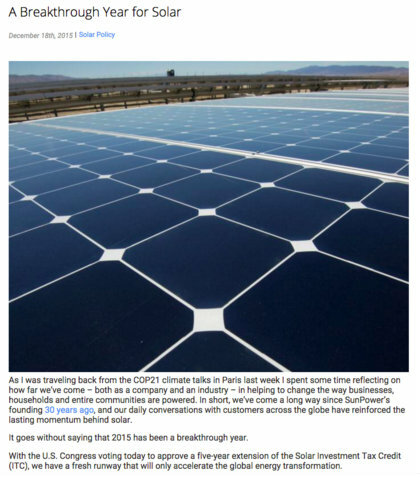 On another solar blog, a company used the news of the tax-credit extension to publish a unique perspective from its CEO. In addition to being timely and relevant, this post takes the topic further by offering broader context and a clear viewpoint, going on to compare the rapid growth of the solar industry to the high-tech boom of the past 30 years. This is content readers won’t find elsewhere, which makes it a more valuable and compelling blog post. Maybe you already knew your alternative energy blogging strategy could use a revamp, but you’re just not sure how to approach industry news in a fresh, differentiated way. If this sounds like you, check out these blog topic generators from HubSpot and BlogAbout, try some of these 27 brainstorming techniques for blog post ideas, or try out this newsjacking blog post template by Alex Fredericks. With a fast-growing industry that generates news frequently, renewable energy companies have a great content opportunity on their hands. Make the latest news your own by identifying, interpreting and expanding on trending topics to set your company’s blog apart from the pack. Why Don't More Energy Companies Embrace Content Marketing?